Frame rate up to 1700 fps in 640 x 512 Pixels. The Cheetah-640CL camera is a high resolution, compact infrared camera, equipped with a dedicated low noise InGaAs detector array working from 0.9 μm up to 1.7 μm. The camera is dedicated to high resolution NIR imaging. Cheetah-640CL is the fastest large format InGaAs camera worldwide. Full frame rates of 1700 Hz can be achieved. Even higher speeds are able in the windowing mode. The Cheetah-640CL is available in 7 different models, the camera with full frame rate 1700 Hz, with full frame rate 400 Hz and with 800 frames per second. Each of these models can be equipped with the VisNIR detector 400-1700nm as well. The Cheeta640CL 110 Hz is available with a TE3 cooler. With its TE3 cooled sensor and water cooled camera head, the Cheetah-640CL TE3 is a highly sensitive camera achieving ultra low dark current at long integration times. 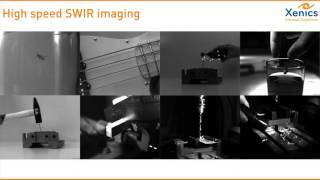 It offers you an excellent measurement tool to image low light levels in the SWIR range such as for semiconductor failure analysis or for luminescence spectroscopy applications. The Cheetah- 640CL TE3 is delivered with a software development kit which offers direct access to various camera settings and allows easy integration with your own CameraLink image grabbing system.